You may know the story of Gideon in the Bible. We immediately picture him as brave, fearless, and strong, the words “mighty man of valour” spring to mind! However Gideon had very low self esteem, was fearful, insecure, and was trying to hide when God sent his messenger to tell him he would save his people. He even described himself as a nobody from the poorest clan, the least in his family, not recognised by anyone for anything! However he discovered that God had a better opinion of him than he had himself. His job was to figure out (with God’s help) how to get rid of the enemy that was raiding his family’s crops, and restore the economy back to those who had worked hard. 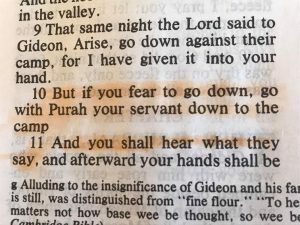 God had a great suggestion… ‘If you are afraid, take Purah yourservant with you ‘. It is always good to have someone you trust with you, when you are facing big issues. Purah was loyal, he knew Gideon’s insecurities yet he was fiercely loyal, gave great advice, risked his own reputation, and did not divulge Gideon’s weaknesses. Purah did not seek his own recognition, he understood “For the Lord and Gideon” he promoted Gideon above himself. Do you have a Purah in your life? I would venture to say we all need a Purah __a mentor, an older, wiser, loyal person., someone who will walk with us relationally, someone who will call us mighty when we are still weak because of the potential he sees in us, someone who will address us as warriors even when we are making plans to runaway from the fight! Business Edge was founded on the principles of Pastoral Care and Support, Mentorship and Encouragement. Professional Isolation is a big issue particularly as entrepreneurial business owners and leaders who hold a Christian Worldview. Business Edge came about to fill that gap, to celebrate your success, and to encourage you to greatness even when things look unfruitful at times. Go to https://www.businessedge.org.nz and join a group who are connected daily by prayer and pastoral support.